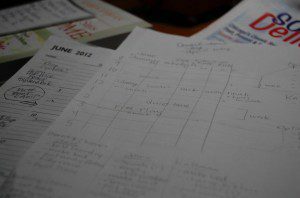 As a stay-at-home/work-at-home mom, I find myself in desperate need of a schedule. The wild ones are back and I need a plan. Scheduling things always sounds like a great idea but ends up being a lot of work. And sticking to the schedule can be downright infuriating. But, I’m making the plan. I hope that by giving them a set time when I’m working and time when I’m not, they will feel more relaxed. Mom will be sitting at the computer for around 3 hours a day, they will need to entertain themselves. Now, with the youngest being almost 5 and the oldest being 10 this should be possible. I’ve drafted a schedule. It involves time for TV, Computer and reading but also time for chores and playing by themselves. They each receive a list of possible chores to be done for the week. Any chores that aren’t done by our free time on Friday will get done then. We’ve been working on chores for the last 6 months so they are used to this idea by now. I have also found that certain necessary items have been hard to get done. Like baths. So, now Bath is a chore. We’ll see how that goes over. I’m thankful to have my kids and I’m really thankful to be home with them. But, I am still a person and I find I will have a better time with a schedule and some time to work on my interests. My superpowers are organization, scheduling and clear headedness. I am using them to guide my minions through the next 3 months. I have SO been there! I have done this. The problem we have found is that life happens. You can PLAN to do certain things at certain times but the reality is that it rarely seems to happen that way. Especially when you have 4 kids! I have found that with my kids it is easier to do daily things….we have a morning chore time and they have certain chores to be done in it. If they are NOT done, then they continue with chores when everyone else is playing. Same with the afternoon chores and dinnertime chores. They are given plenty of time to do them but if they choose not to, then they are choosing to give up play time. Let us know how this plan works for you! It seems chores are a HUGE part of what I struggle with! Thanks for the input! I am still learning. I hate complaining and whining and I’m afraid if i have them do chores for too long I might have to endure that! 🙂 I haven’t used any plan this week and I am now sure that I will need it. I just refuse to pay someone else to watch my kids all summer. You know? I hate the complaining and whining also! That is why I break up the chores into three sections during the day. Also, I have motivators for them….morning chores done without whining, then they get a greater input in lunch options. Afternoon chores without whining equals afternoon snack. After dinner chores equals family games or reading together. Those types of short term things work great with my 6 year old and my 12 year old with Asperger’s. My 13 year old is not as big of a deal. She understands the whole lack of whining thing a bit better! I love this! I broke the chores up into morning and evening. The evening chores are going fine – they are used to that. My 4 year old is completely despondent and hysterical about doing morning chores. I think she needs a little hand holding. My oldest is actually thriving with the responsibility. She is doing her chores before anyone else is even out of bed! I’d love to hear what kinds of chores you have your kids do. It’s hard to think of things I know they can do mostly by themselves. I love it! A good way to manage the whole thing still staying with your kids and offering them interesting / useful things to do. very interesting.